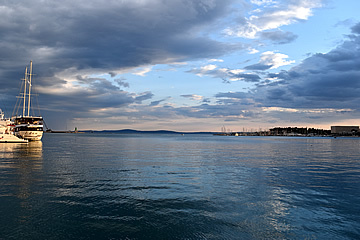 The Adriatic city of Split has something to please everyone: the substantial remains of a fascinating Roman palace, wide ocean views, fabulous food and wine, and exquisite tiny ancient churches. 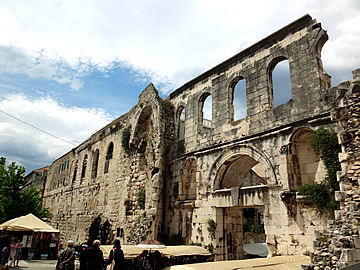 On the shores of the Adriatic Split has grown around the palace built by Diocletian for his retirement. We stayed in the Hotel Slavija which is inside the palace! 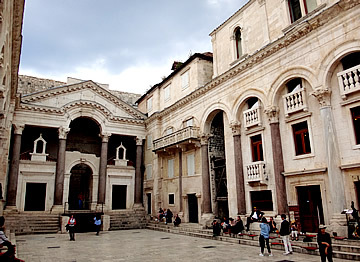 The peristyle, once the central courtyard of Diocletian's palace. At the end is the prothyron - the grand entrance to the emperor's apartments. 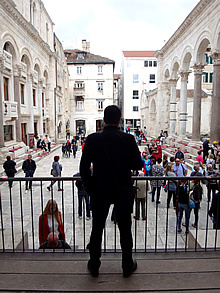 Diocletian would stand on the platform in front of the central arch so that the people could see and worship him as a deity. 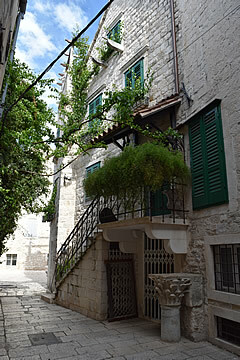 There was a Roman settlement here prior to Diocletian building his palace in 295 AD, ready for his retirement to his native Illyria. 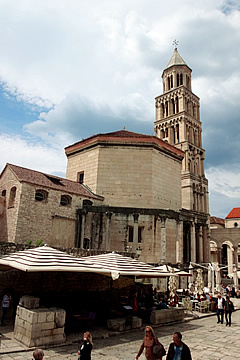 Diocletian became emperor in 284 AD at the age of 39 and retired 21 years later, dying at the age of 67 in 312 AD. The palace measured 200m by 240m and housed a military garrison as well as the luxurious apartments. The Golden Gate used to have four statues of the tetrarch of emperors, on plinths at the top. 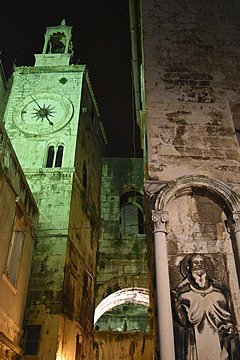 Diocletian was a persecutor of Christians, martyring many including Domnius who would become the city's patron saint. 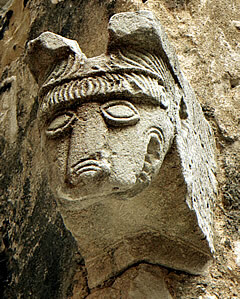 The statues and much else from the Roman period were destroyed by Christians. 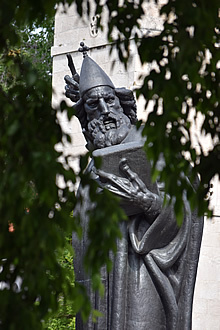 Outside the Golden Gate stands the 8m statue of Bishop Gregory of Nin. 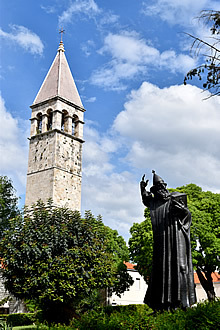 Behind is the bell tower of St Arnir outside the palace. Diocletian ruled with a co-emperor Maximian - himself in the east, Maximian in the west. Later he established a tetrarchy adding two junior co-emperors, who were also the emperors' successors. This system was designed to deter assassins because a successor was ready to take control when a senior emperor died. 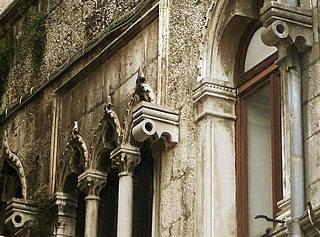 Carved faces under corbels on the Golden Gate above the entrance. Originally the statue was erected in the peristyle but it was removed in WW2 by Italian occupiers wanting to get rid of any national symbols. Ivan Mestrovic. This northern gate was the main entrance to the city, the road from here once led to Solin (Roman Salona) where Diocletian may have lived as a boy, the son of slaves. 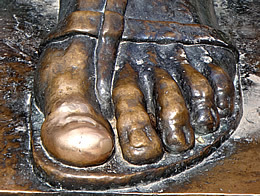 Tradition has it that if you rub the left big toe of the statue of Bishop Gregory your wish will come true! 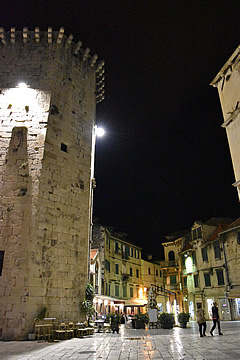 Four gates allowed entry to the palace: the Golden Gate on the north side, Iron Gate to the west, Silver Gate to the east, and Brass Gate to the South - the metallic names were given to the gates by the Venetians who took control of Split early in the fifteenth century. 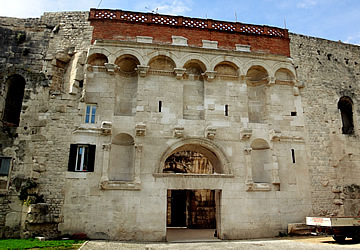 The south side of what was once Diocletian's palace fronting the harbour on the Adriatic, in the centre is the Brass Gate. 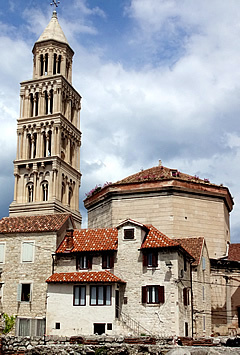 The bell tower is part of the cathedral, once Diocletian's tomb. 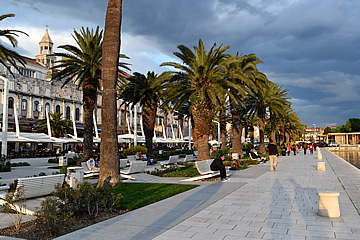 Along the waterfront is the Riva. We learned from our guide that cravats come from Croatia: when their men went to war the wives tied a cloth round their husband's neck so that they could recognise each other when they were fighting alongside other armies and also to remind them of Croatia. The Iron Gate on the west side of the palace. 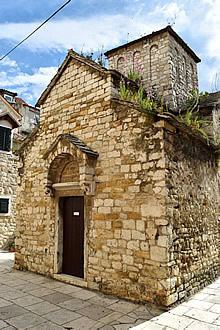 The 6th century Church of Our Lady of the Bell Tower was built in the guard passage above the interior gate; alongside are the 11th century bell tower and 14th century clock. The Silver Gate on the east side of the palace, near the green market. 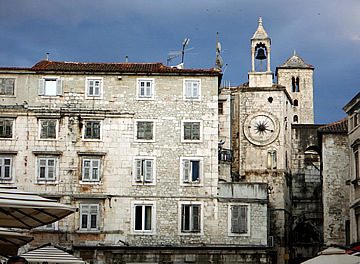 The octagonal cathedral of St. Domnius - once Diocletian's mausoleum. Diocletian's mausoleum in the south-east quarter of the palace complex was converted into a church in the seventh century by Bishop John of Ravenna and is now the city Cathedral of St. Domnius. 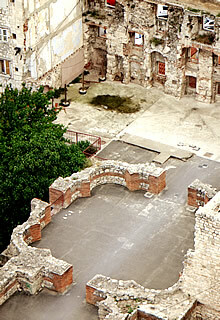 The wide paved street is the decumanus, one of two main Roman roads through the palace. 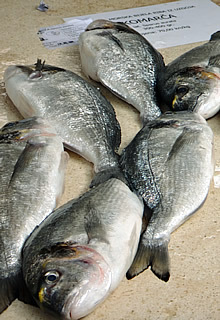 The decumanus ran east-west, the cardo north-south, quartering the complex of buildings. 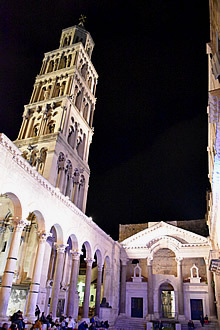 The octagonal cathedral is surrounded by a series of original Corinthian columns. 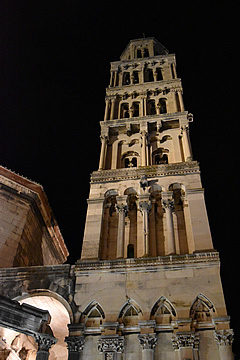 The 60m bell tower is much later, begun in the 13th century and taking over 300 years to complete. 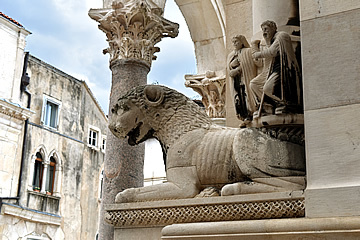 At the entrance to the cathedral from the peristyle are two beautiful Romanesque lions, both carrying figures on their backs. 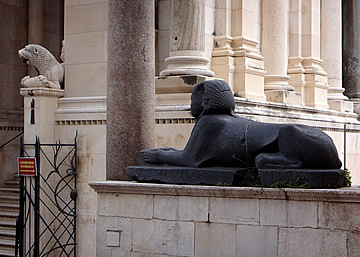 A 3500 year old black granite Egyptian sphinx in the peristyle, near the entrance to the cathedral, from the reign of Pharaoh Tuthmosis III. 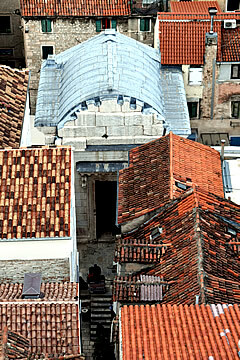 View west from the cathedral bell tower. 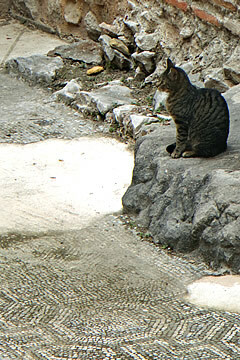 A cat contemplates the Roman ruins. We climbed the bell tower for very good views over the city and then visited the Temple of Jupiter - now the Baptistry, which is on the western side of the peristyle. 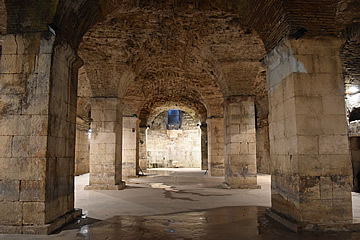 The south west quarter of the palace held three temples as well as baths and the emperor's living quarters and main reception room - his dining room, the triclinium, was on the south east side. 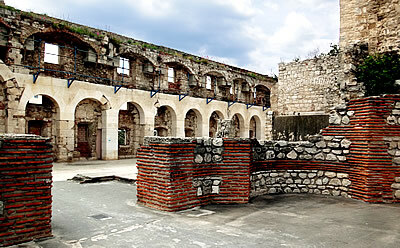 The remains of the palace dining room in the south east corner, the southern boundary of the palace beyond. 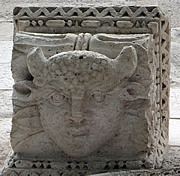 Temple of Jupiter (the Baptistry) from the cathedral bell tower. the statue of John the Baptist is by the ubiquitous Ivan Mestrovic. 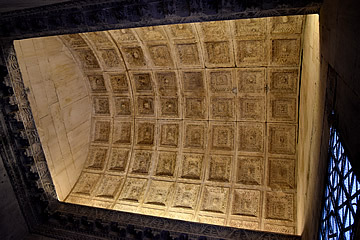 Finely carved entrance to the Temple of Jupiter. 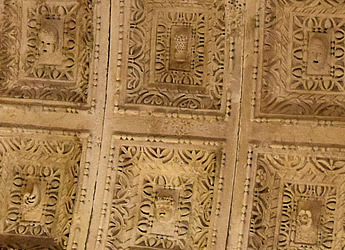 Fine coffered barrel vault in the Temple of Jupiter, detail below. 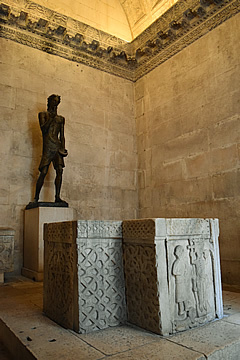 The Temple of Jupiter, though built in Diocletian's time, has artefacts within from later periods including a beautiful 11th century font with a carving of a subject grovelling before an enthroned ruler. 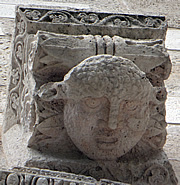 The style of geometric design on font and 11th century sarcophagus is very celtic in nature, very attractive. 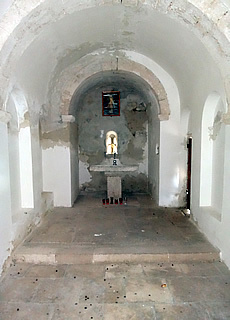 11th century sarcophagus and font. In the evening there is often music in the peristyle. 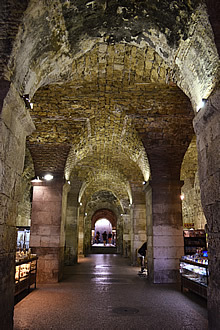 Beneath Diocletian's platform on the peristyle is an entrance to an underground area, also accessible from the Bronze gate. 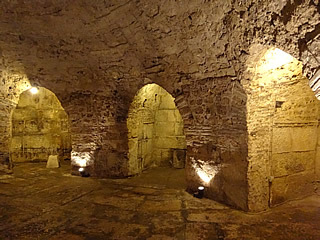 The arrangement of the basement rooms is identical to that of Diocletian's apartments above. 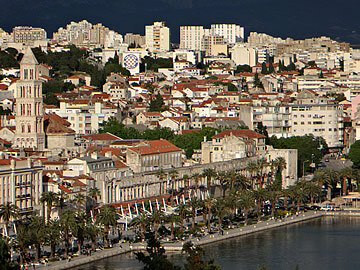 We learned a lot on our walking tour of the city with Split Walking Tours. 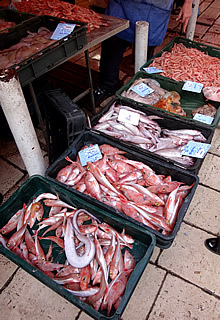 We combined a history tour with their culinary tour so we began by visiting the fish market to the west of the palace where we chose seafood to be cooked for our lunch: scampi, 4 red mullet, 1 wild sea bream, and bonito. 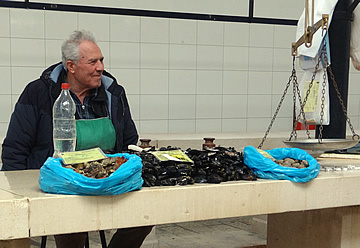 This genial man was selling oysters, cockles & mussels. 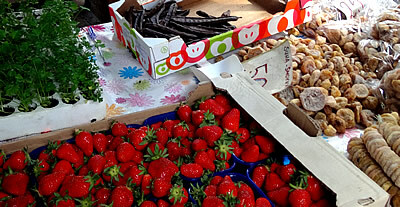 A little culinary history along the way while we explored the markets and chose food - in the green market near the seafront east of the palace we picked up cherries for dessert. 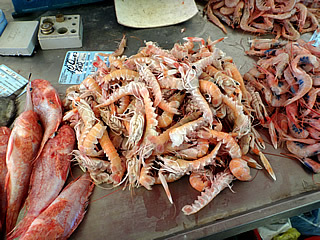 Everything looked fresh and appetising, lots of herbs, dried fruits and plants for sale too. Sugared figs, on the right, seem to be a local specialty - we loved them! 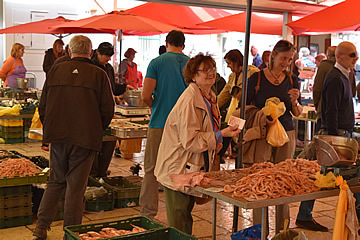 There is a covered and outdoor section - outdoors there seemed to be more smaller producers, farmers and their wives. 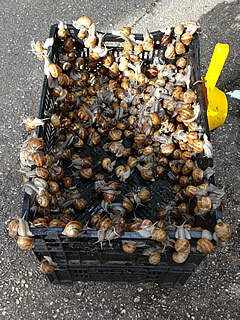 We took the lunch ingredients to Diocletian's Wine House and gave them to the chefs with whom we had a discussion about the kinds of dishes we like. 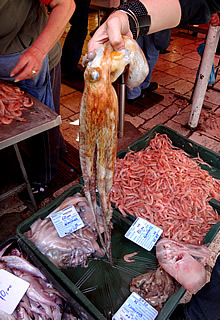 Croatians traditionally have four meals a day, with the main one around lunch time. After dropping off our food we were taken to the Golden Gate to meet the guide who was to give us the historical tour of the city. 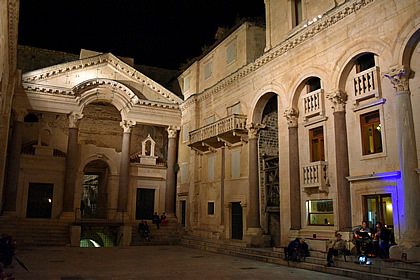 When the tour was finished we were taken back to Diocletian's Wine House. 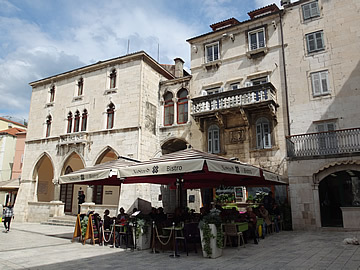 In front of the restaurant is said to be the spot where Emperor Julius Nepos (from whence nepotism comes) was assassinated, heralding the end of the Roman Empire. On the street here is said to be where Emperor Julius Nepos was killed by soldiers. 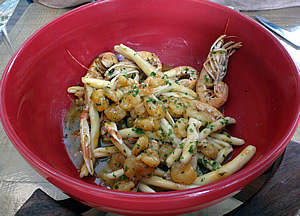 Pasta & scampi first course. Our lunch was fabulous! 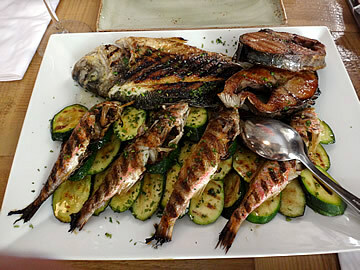 A fantastic green pasta starter with the scampi, then the grilled fish - the bonito was stunningly good! 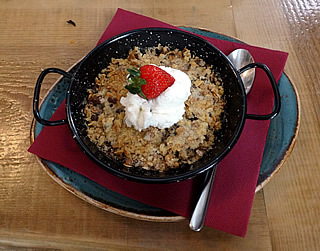 And a fabulous cherry crumble to finish. We had an excellent wine and took our time - extremely enjoyable! We made a point of congratulating the chefs on making such a magnificent meal from our chosen ingredients. 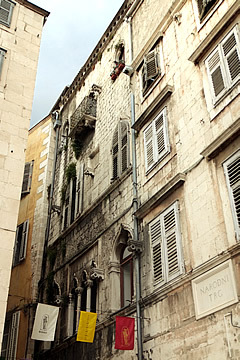 The Riva between Diocletian's Palace and the sea (which once washed right up to the palace itself). 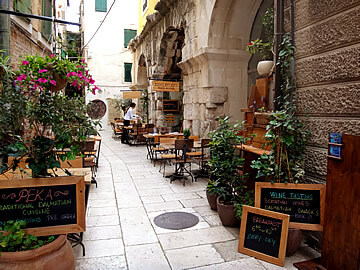 This modernised area with its hard stone paving is not particularly loved by the locals! 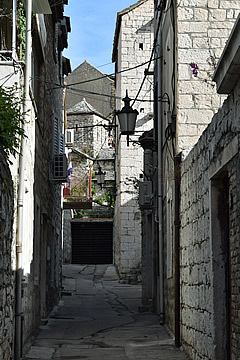 We explored Split quite a bit on our own, wandering the atmospheric alleyways, especially the medieval streets west of the palace. Note the repurposed Corinthian column! A beautiful Renaissance facade just off Narodni Trg. 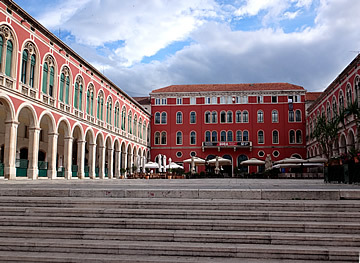 West of the Iron Gate, Narodni Trg and its 15th century Town Hall are at the heart of medieval Split. Vocni Trg, just outside the palace on the west side off the Riva. 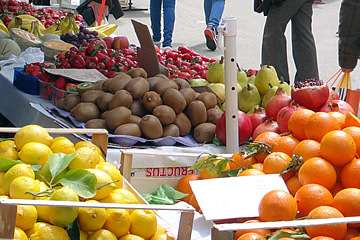 The name means Fruit Square because a fruit market was once held here. 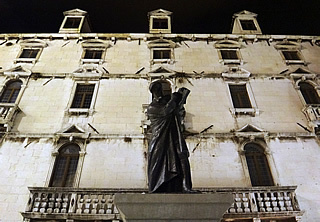 Statue of Marko Marulic, Croatian poet and Renaissance humanist, on Vocni Trg. Ivan Mestrovic (again!). Poles with wet sheets suspended were slotted through the cylindrical holes either side of windows; the wet sheets hung in front of the window openings and a breeze drying the sheets would blow cool air into the rooms behind - an early form of air-conditioning! 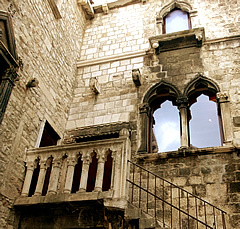 Papalic Palace, a fine late Gothic residence now housing the city museum. 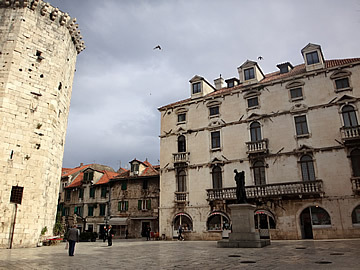 The octagonal tower on Vocni Trg was once part of the Venetian fortress. 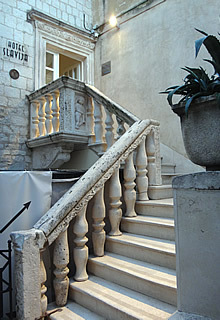 Papalic Palace - city museum. 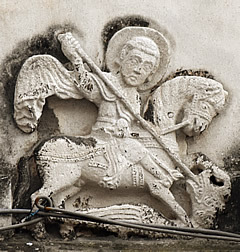 A rather finely carved St. George slaying the dragon. On a street corner near the city museum. 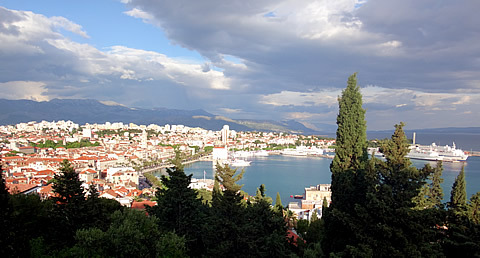 Split from the Marjan Peninsula. 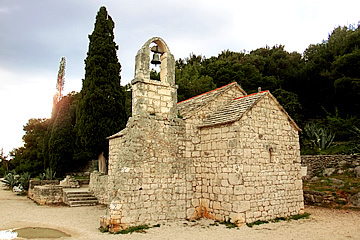 The beautiful church of St Mikula, the oldest in Veli Varos; blind arches on the tower and wild flowers on the roof. 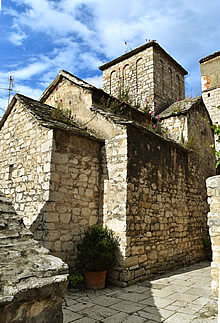 Wandering the narrow alleys of Veli Varos we spotted a small church, hemmed in by houses, which turned out to be St. Mikula. 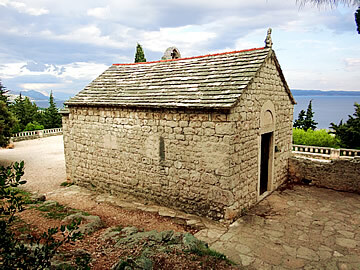 We wandered west of Split and onto the Marjan peninsula, an extensive wooded area surrounded on three sides by the sea. 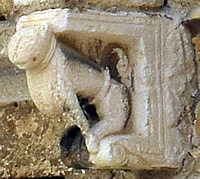 One of the animal forms flanking the lintel above the entrance to St Mikula. They support a covered arch which shelters a narrow platform - no doubt it once held some kind of devotional statue. Climbing up we quite quickly came to a more famous church: Sv Nikole Putnika - St. Nicholas of Travellers. 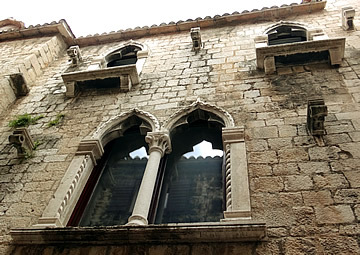 It was built in 1219 by another citizen of Split: Rake and his wife Elizabete. The beautiful simple interior of Sv. Nikole Putnika. St. Nicholas is the patron saint of sailors and this church could have been seen from the sea - the views from here are spectacular. 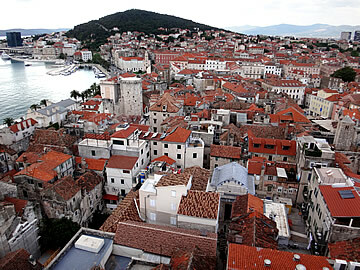 The Rough Guide to Croatia (2013) was used on this trip.